Bank of Baroda is looking for eligible candidates for following posts of Probationary Officer from those candidates who have taken the CWE for Probationary Officers/ Management Trainees conducted by IBPs in 2011. All eligible and interested candidates can apply online at www.bankofbaroda.com. CWE Score : Minimum 125 for General/ OBC and 105 for SC/ST in the common written examination conducted by Institute of Banking Personnel Selection (IBPS) with all other required qualification. Age Limit : Age relaxation as per Govt rules. Educational Qualification : Candidates should check this page again after 21 February 2012 for all details qualifications. How to Apply : Eligible applicants are required to apply ONLINE only through Bank of Baroda website (www.bankofbaroda.com). No other means / mode of application will be accepted. Online Registration site would be up to 10-03-2012. ONLINE Registration starting Date & Time : 10:00 hours of 21-02-2012. 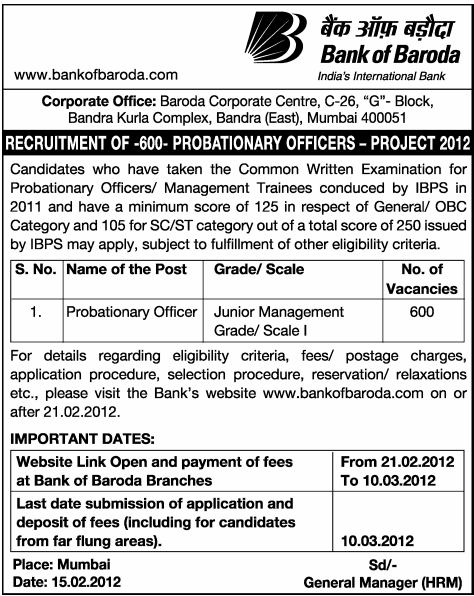 For More details and apply online visit Bank of Baroda Probationary Officer Recruitment 2012 page.